Sources close to the investigation said the 22-year-old man arrested was a supporter of radical Islam. POLICE INVESTIGATING THE stabbing of a French soldier in Paris have arrested a suspect sources described as a supporter of “radical Islam”. “The suspected perpetrator of the attack on a soldier on Saturday evening in La Defense (business district) was arrested this morning,” Interior Minister Manuel Valls said in a statement. 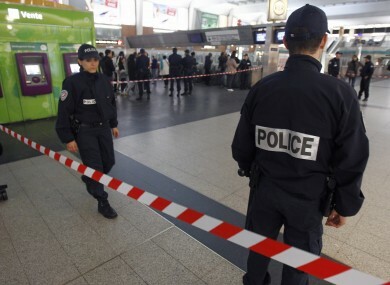 The statement said the suspect was arrested in Yvelines, just west of Paris. But the sources urged caution in a case that is still in its early stages, saying the suspect was not previously known to authorities as a radical. “The investigation will determine at what time he decided to carry out a jihadist act,” one of the sources said. The suspect was known to police, having carried out petty crimes and thefts, a police source said. A police source said he was identified thanks to video footage from the crime and traces of his DNA found on items left at the scene in a plastic bag, including a knife and a bottle. In his statement Valls expressed his thanks to investigators. “The investigation carried out under the authority of anti-terrorist prosecutors should determine… the environment and motivations of this young man,” it said. The Paris prosecutors’ office is to hold a press conference on the arrest at 9.30am today. The attack on Saturday in a busy underground shopping and transport hub echoed the grisly killing of another soldier in London, but authorities have not established a link between the two cases. Valls told Canal+ on Monday that police had “serious leads” on the identity of the attacker, who stabbed and injured French soldier Cedric Cordiez in the neck while he was on patrol with two colleagues. The attacker, described by police at the time as bearded and around 1.9 metres tall, approached the 23-year-old soldier, stabbed him and then disappeared into a crowd. Sources close to the investigation said Monday that the suspect was seen on video praying a few minutes prior to the attack. Cordiez meanwhile was released from a military hospital on Monday morning and rejoined his unit, military officials said. Police in France are seeking to determine if the attack was a copycat of the brutal murder of the British soldier in London last Wednesday. The key suspect in that attack, Michael Adebolajo, was captured on video carrying bloodied knives and a meat cleaver after the attack, saying he had murdered off-duty soldier Lee Rigby because British troops were killing Muslims. Email “Man arrested after French soldier stabbed in the neck”. Feedback on “Man arrested after French soldier stabbed in the neck”.